The mozzarella pictured is homemade but you can use any good quality, store bought mozzarella fresca for this recipe. Drain the mozzarella and salt. In a medium sauce pan, over medium low, gently heat 1/2 cup of olive oil, red chili flakes and rosemary to 175 degrees. Hold for 2 minutes and then allow to cool to room temperature. Mix in the remaining cup of olive oil. 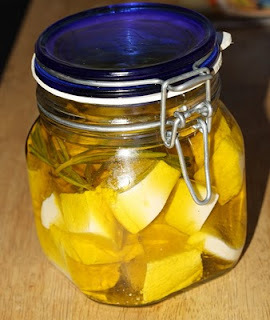 Place the salted mozzarella fresca in a jar or other container large enough to hold the olive oil and cheese. Pour the oil, herbs and chili flakes over the cheese. Marinate in the refrigerator for up to one week. This cheese is delicious speared on a toothpick with a small, ripe cherry tomato and a basil leaf.